A few words of praise, now that everything is all done. First, Brian. We requested he be the lead on our project, even if we had to wait, and we are 100% happy with him and his work on our kitchen. We were happy with him and Kenny when we hired you to renovate our bathrooms six years ago, and it was a more mature, more confident Brian who showed up for the kitchen renovation. We noticed it right away. Brian is extremely conscientious and hardworking, and has the knowledge, experience, and skills to do the work. He also takes great pride in every detail of that work (including the spacing/centering of light fixtures, which you all know I am a bit precise about). 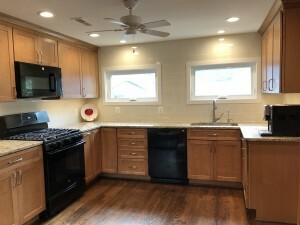 He was attentive and responsive to all our requests, kept us informed every step of the renovation, and addressed all our concerns with the Thomas Custom Builder’s attitude of total customer satisfaction—some times reassuring us that all was as it should be, others validating that something was not right. We were impressed with his taking the time to talk with the County inspector to learn how to calculate wiring in a junction box, so he could learn how to do so for future projects—one example of the pride he takes in doing a job right. He also did a great job supervising and coordinating the trades. You gave us a six week estimate, and I think we ran eight, one week delay due to scheduling the Wolf appliance installer, the second for the electrical/make-up air re-inspection. That’s excellent, as far as we’re concerned. Second, a brief shout-out to Cole. We really appreciated his thorough and knowledgeable responses to our email before the renovation began, addressing our questions and thoughts regarding the process and our selections. His honest and detailed input on our cabinet selection, in particular, helped guide our final decisions, all of which we are totally happy with. Great working with you and Dave again too—which you already know! Emma and I want to take this opportunity to thank you for help us realize our dream for our updated kitchen. We cannot be happier with the end result and the hard work that went into the final product. From all the members of your staff to all of your sub-contractors (minus the dry waller – but David knows that…), the products and workmanship we recieved were top-notched. We specifically want to commend Jose, Clint, and Anthony for their tireless work and professionalism. They were always helpful in addressing any questions or concerns that we had throughout the renovation. If we had one complaint, we would recommend better communication with regard to the draw schedules and invoice receipt. We paid the first draw at the outset of the project, then went several weeks before another draw was requested. Then towards the end of the project Jose asked for a check, then we ran in to confusion with Jacquelyn over what was due. In the grand scheme of things, this was a minor issue and we were able to work through it. Once again, thank you and your team for all your efforts. 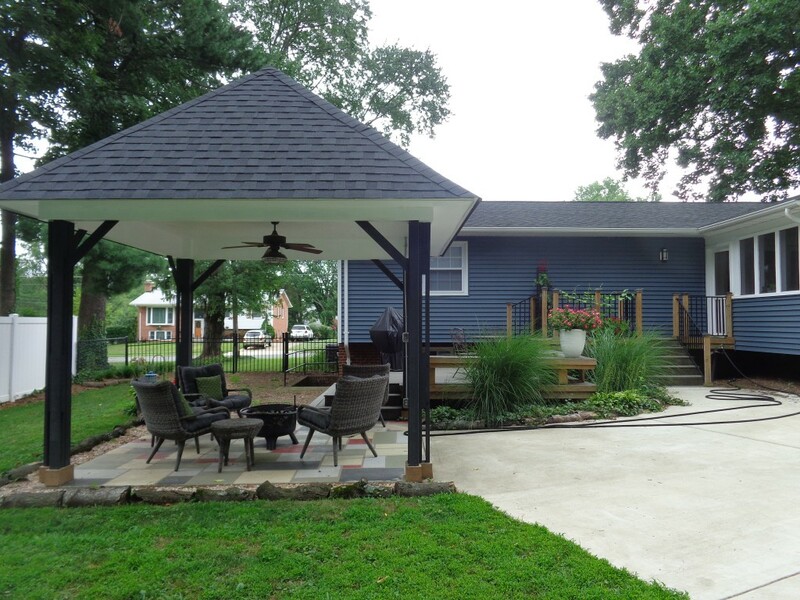 We would (and will) highly recommend Thomas Custom Builders to any of our friends and neighbors. I never submit reviews online, but my family had such a great experience with Thomas Custom Builders that I wanted to share it. We restructured and remodeled our master bath, guest bath, and bedroom, and love the results. Initially I was concerned about price, but over the course of the project I realized how much value we were getting. The design and outcome itself is excellent, but the experience working together was as noteworthy. Rick, Dave, and team put us in touch with an excellent network of designers and suppliers that made a huge difference in designing our ideal remodel within our budget, and that worked well together to stay on schedule and put as little work on us as possible. The onsite team was a pleasure to work with and completely responsive to any questions or requests, and they worked seamlessly with the electrician, tile, and plumber. Even their front office invoicing contact was invaluable in guiding us through the project with recommendations and clear expectations. I’d recommend this team to anyone. “Other than the purchase of our home, the addition to our house was the largest expenditure we have ever made. Because of this large investment, we were very critical of the contractor that we chose to complete the project. The decision of which contract to choose was not something we took lightly. After meeting with several contractors and seeking numerous recommendations, we chose Thomas Custom Builders. The experience of completing this project and the final product far exceeded our expectations. It was evident throughout the project that you both have many years of experience and are true craftsmen. We have heard many horror stories about contractors and problems homeowners have had with them during their project. We never had those experiences. You always talked with us about the progress of the project, next steps/phases, and projected timeframes for completing those steps/phases. You always stressed how important it was to complete the project within budget while still maintaining a high level of craftsmanship and you performed as promised. Again, honesty was always paramount for you both and that was very much appreciated. “As you know, we took our time talking to quite a few builders and were very careful. We wanted to be comfortable with both the professionalism and trustworthiness of our choice. You and your crew proved that we chose well. “There were days when the workers were in the house with our two children for a short while before we were able to get home from work. We never felt uncomfortable with this situation, and if you have children, you probably know that this is the highest praise a parent can give: you can trust them with your kids. “There were several issues that arose during the re-construction project. He met all with a concrete ability to solve the problem while still maintaining cost schedule and performance. From his personal touch during the design phase, though the construction ‘mess’ (which by the way was cleaned daily!) to the final cosmetic touches he made our project special.